In this post, I will be focusing on attire. You might notice in the pictures of my bullet jorurnal that I did very little for my dress spread. Some of the techniques I’m writing about today are things that I thought of in hindsight that would have been wildly helpful for planning out lots of the steps and details. So basically, do as I say, not as I did. For Jon and I, the attire for both the ladies and the gentlemen were important to us. 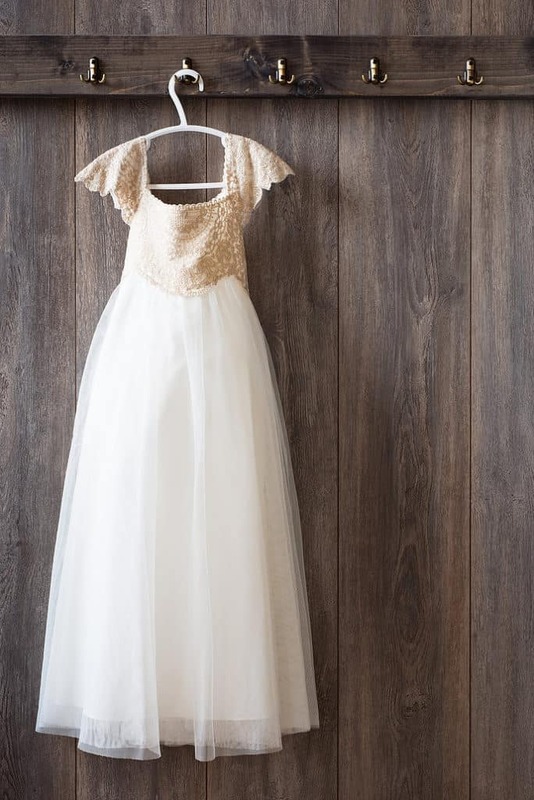 If attire isn’t a priority for you and you plan on buying a dress that is not a wedding dress (for example, an off the rack dress from a store) to save money, then you don’t need to worry about time quite as much. But let’s assume you are getting a full on wedding dress and the bridesmaids are all getting matching (or nearly matching) dresses from a dress retailer. Having a Pinterest board for inspiration is great, but you need a concrete place to actually plan the details. Those details will need to be taken care of as soon as possible, so start plannin’. Speaking of visual inspiration, you should really go through an issue of the Knot (click here for a Kindle edition – the first 30 days are free!) Also, here are my Pinterest boards regarding wedding stuff. Hopefully they will help you save some time on research. I bought my wedding dress from a small business in Wichita, and I got it at a massive discount because it was a sample dress that they were retiring. This meant that I didn’t have to order it and have it shipped from halfway across the world, which was awesome. Because I didn’t experience the process of ordering my wedding dress, I was woefully under prepared for the bridesmaids dresses. I had a particular brand in mind and took my time waffling between a few styles and colors. By the time I could get all my ladies in to get measured and I had everything picked out, it was too late. I couldn’t order from that brand because it would take some 15 weeks to get the dresses made and shipped, which cut about two weeks until the wedding. Seeing as two of my bridesmaids lived out of state and the dresses needed to be altered, it wasn’t going to work for my timeline. I managed to scramble and find some similar dresses for a similar price that would ship in 12 weeks, so the crisis was averted. But it was a ton of stress that was totally avoidable. I’m telling you all of this so that you don’t let it sneak up on you like it snuck up on me. Learn from my mistake! Use your bullet journal and get this all taken care of before it consumes your life for two weeks and puts you on the edge of a meltdown. 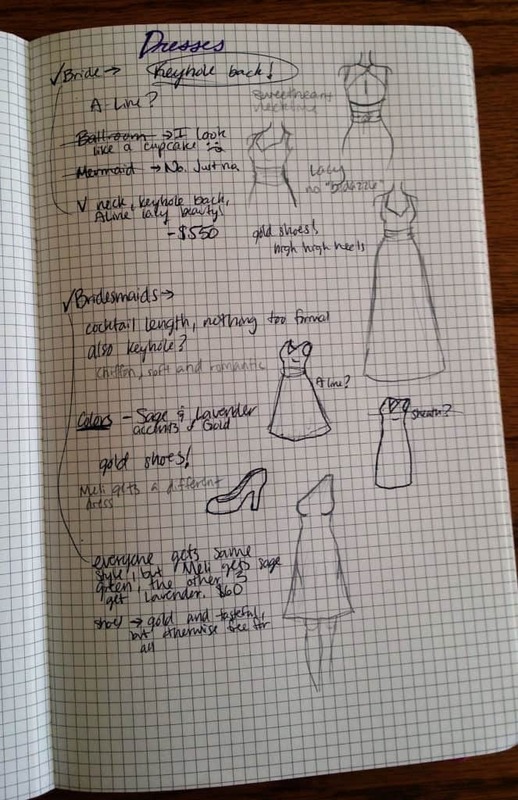 What I did to plan for my wedding dress was dreamily sketch out some styles in my bullet journal. Of course, I had been gobbling up all wedding gown images on Pinterest and in magazines, but I liked to draw out my dream dress and take notes on what I did and did not want. You can do this with the men’s attire as well to get an idea of the combined look. This will also be helpful to jot down terms that you see with certain styles. For example, I learned the difference between a trumpet, A-Line, and mermaid dress. Using this knowledge, I was able to tell the dress shop workers that I did NOT want a mermaid, but a trumpet would be okay. This helps the employees at the dress shop eliminate certain dresses without making you try them on. As the dress shopping continues, you can keep information like price, your sizes, alteration costs, and accessories like veils or sashes tucked away in one convenient location. If you are ordering your dress online, the bullet journal can be invaluable for scrawling down websites, style numbers, prices, and other data so you can compare your options. Of course, this applies to shopping for your bridesmaids dresses online as well. Keeping all that information in one place will save you a headache. Your head is already going to be exploding a little bit, so why not make this one thing easy? I personally left the men’s attire to Jon because I don’t know jack about suits, but I know that some couples decide that sort of thing together or it’s all arranged by the bride. Whatever the case, the above mentioned process works for clothes of all gender. I am also including hair, make up, and nail planning in this post because it fits with the theme. For me, none of these were time sensitive. I did my own make up, using Sephora’s Liquid Foundation, the Naked2 Palette from Urban Decay, and Ben Nye Makeup Sealer, which is essential for an outdoor wedding. All you need to do your own makeup is some quality materials and some practice! For my hair, my auntie hooked me up and did it for me. Of course, not everyone has a wickedly talented aunt to do their hair for them, so you might want to shop around and find one. Keep in mind that you will need to schedule in a couple of practice sessions so your stylist can fine-tune your look well before the big day. As for nails, the bridal party went and had our nails done over the bachelorette weekend. We just went to a local nail parlor with no appointment. If you plan on hiring someone for make-up or a special hair stylist, the bullet journal is a great place to start planning for those services. You can shop around, compare prices and availability, write out appointments, and get their contact information written down all in one place. This will be great as you get closer to the wedding, because searching around for phone numbers is precious time that could be used being productive. Find wedding dress I love! This will help you feel less overwhelmed and more accomplished as you cross those steps off of your list. 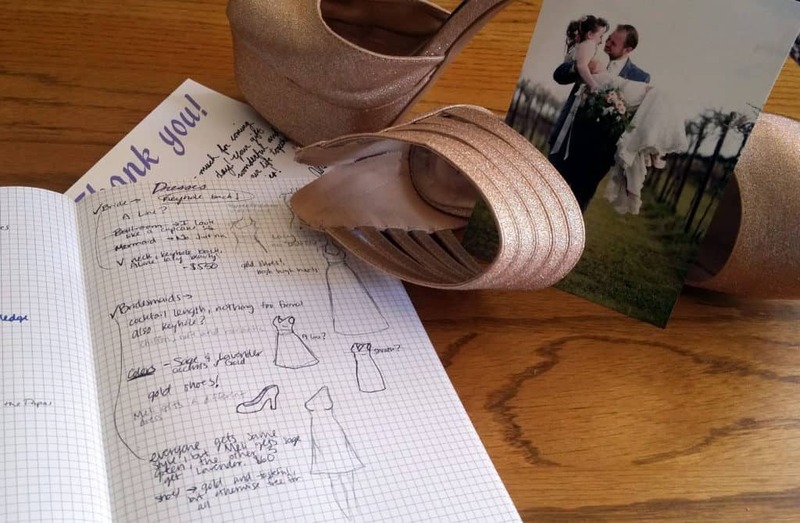 As you can see, there are many ways that your bullet journal can save you time and headaches while you are planning all the details of your wedding. 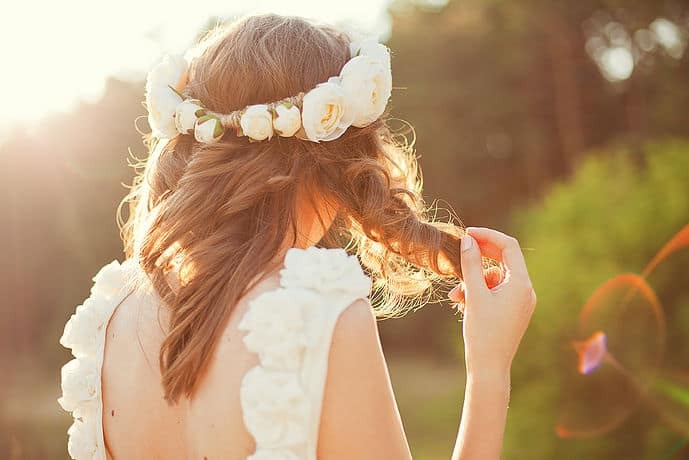 You want to look fabulous on your big day, and you can do that without losing your head. It doesn’t have to be complicated as long as you remember your deadlines and you write everything down in your bullet journal. With a little bit of planning, everything will come together beautifully!